Today’s drift scene, particularly in America, is almost completely gripped with nostalgia for the late 1990s and early 2000s, dreaming after cars covered in lightning bolt graphics and giant body kits. But what did the scene look like at the time, not viewed through rose-tinted glasses? Some of you may recognize the voice of NoriYaro narrating this High Performance Imports DVD. NoriYaro is still the big name in english-language coverage of Japan, at least on video. 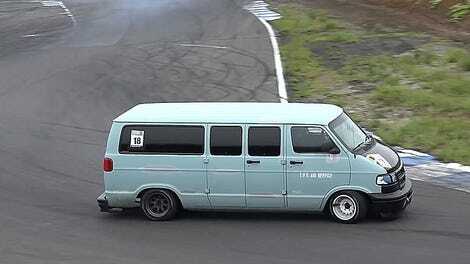 Even for street drifting, the sketch factor in this video is unusually high. Spectators stand on the outside of the turn, for instance. And the drivers in question are far from perfect. One S14 Nissan Silvia ends up causing a multi-car wreck. What’s eternally surprising to me in watching street drift videos (and getting up close and personal with it as well) is that the driving itself never quite holds up with what’s done on a dedicated track. So much of the energy is in the meet up, in the spot-finding, in hunting to staying away from innocent bystanders, in the risk of crashing into curbs, trees, onlookers, or off cliffs, in the threat of arrest. As ever, take it to the track.